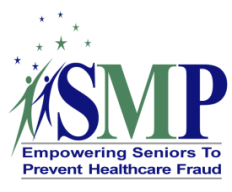 SMP (Senior Medicare Patrol) is a program whose mission is to educate Medicare beneficiaries, their families and caregivers about Medicare benefits and to empower them to prevent, detect and report health care fraud, errors and abuse. Through a partnership with the Maine Department of Health and Human Services-Office of Aging and Disability Services, the Area Agencies on Aging (AAA’s) and Legal Services for the Elderly (LSE), the SMP provides outreach, education and counseling. For more information about the Maine SMP, click here for the SMP fact sheet. If you have questions about your Medicare statement, need assistance with billing issues, suspect healthcare fraud, errors or abuse, would like to schedule a presentation for your community group or organization, or have an interest in volunteering, contact EAAA at 1-800-432-7812. The Maine SMP is funded by the U.S. Department of Health and Human Services and Administration for Community Living. For more information about the national SMP Program, please visit: https://www.smpresource.org/Content/What-SMPs-Do.aspx.